Number 29, East Fourth Street, New York City, known now as The Merchant’s House Museum is unusual because it is so well preserved, inside and out. It gives a unique insight into life in the 19th Century, a period of time when there was much change in the city around it. The house was owned by successive generations of the Tredwell family for almost a century. The house was built on speculation in 1832 by a hatter called Joseph Brewster. He sold it three years later in 1835 for $18,000 to Seabury Tredwell who was recently retired hardware merchant. Seabury had married Eliza Parker in 1820. He was 40 years old, and she only 23. Together they had eight children – two boys and six girls - the youngest of whom, Gertrude, was born in the Fourth Street house in 1840. Seabury died in 1865 towards the end of the Civil War. Eliza died 17 years later. Unusually for a prosperous family, only three of the children married: Elizabeth, Mary Adelaide and Samuel. Horace moved out to Lafayette Place, and Sarah to the residential Hotel Cadillac in Times Square. That left three daughters, Phebe, Julia and Gertrude living in the house together, using their inheritance to survive. Over the next fifty years, the neighbourhood changed to one of small industry and workers’ tenements. The theatres and shops relocated uptown. The fortunes of the children declined similarly and the family slowly spiralled into poverty. In 1906 Sarah returned to the house briefly before her death. Phebe died the next year, and Julia in 1909. Gertrude continued to live in the house for a further twenty four years, increasingly reclusive in a completely changed world outside. Remarkably, she preserved the house “as Papa wanted” with original furniture, decorations and personal possessions. Today, the only living descendants of Seabury and Eliza are from the lineage of their son, Samuel. After the death of Gertrude in 1933, the heir to the house was Lillie Nichols, Gertrude’s niece. At that time, Lillie planned to sell the home and the possessions at an auction. However, a distant cousin of the family, George Chapman instead offered to buy it on behalf of a non-profit organisation he created to conserve it. He looked after it until his death in 1959. However, by then, it was in a poor state of repair and a large investment was needed to preserve it. The house was looked after for three years by temporary caretakers, until in 1962 The Decorators Club of New York City, an organisation of female interior designers, took it over as a project, raising funds to restore the building and reproducing the furnishings and carpets. The museum was kept open under the name of the Old Merchants House. In 1965, the house was designated a New York City Landmark by the newly created Landmarks Preservation Commission. One year later it was made a National Historic Landmark. In 1968, architect Joseph Roberto was asked to advise the Decorators on the extensive structural repairs needed after water damage. Roberto committed himself to the full restoration of both the exterior and the interior, requesting funding from many donors in four stages over nine years. The work included the restoration of the ornamental plaster work in the parlours. The museum reopened to the public in November 1979 and in 1981, the restored interior was designated as a landmarked site by the City of New York. After Roberto’s death in 1988, the museum raised money to hire professional staff to conserve it. In 1997, a grant of one million dollars provided an endowment that would give the museum long term financial security. In 1999, it joined the Historic House Trust of New York City. The historical value of the Merchant’s House Museum is undeniable. This landmark is more than just a historical residence. It is an incredible glimpse into the 19th century and the history of New York City. Miracle on Fourth Street is the story of the preservation of a family home that belonged to one of the early merchants of New York City. Lived in by one family for almost 100 years, the house was preserved as a museum upon the death of the last family member. 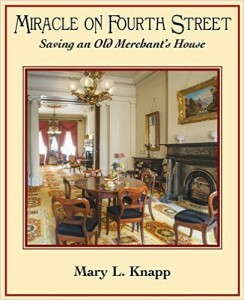 The book recounts the struggle of the founder of the museum to realize his quixotic vision, the critical intervention of an architect who devoted his life to an authentic structural restoration, and the dedication of a group of professional women who would not give up their goal of reclaiming the beauty of the original furnishings. 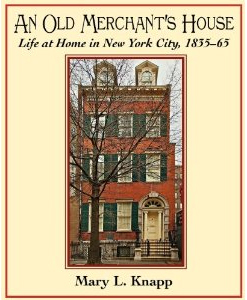 An Old Merchant’s House provides an authentic view of the domestic life of the prosperous merchant class in mid-19th century New York. It is based on memoirs, diaries, letters, and a preserved antebellum home belonging to the same family for almost 100 years. The daily life and habits of that family and their neighbors, from entertaining and etiquette to medicine and hygiene, and more, are revealed in fascinating detail.